There have been 7 recent cases of Equine Herpesvirus Myeloencephalopathy that have been confirmed in California. 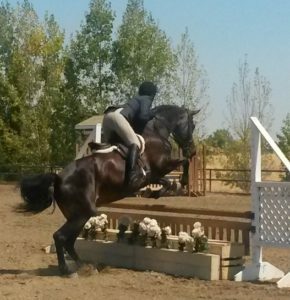 Four of the cases participated in a horse show in Las Vegas, NV on October 24-29, 2016. EHV-1 can cause four manifestations of disease in horses, including neurological form, respiratory disease, abortion and neonatal death. There were no new clinical EHV-1 horses moved to quarantined isolation today at the LAEC (Los Angeles Equestrian Center). Currently, quarantined isolation is home to twelve (12) horses. To date, there have been seven confirmed cases of Equine Herpesvirus – 1 Myeloencephalopathy (EHM), one of which was euthanized due to the severity of the disease. The six neurologic cases and four confirmed EHV-1 positive horses continue to show improvement and remain in isolation. In addition, two febrile horses in isolation have twice tested negative and will continue to be monitored in isolation. Don’t forget to vaccinate against this disease! All USEF shows require proof of vaccination against EHV in the last 6 months prior to any show. Give our office a call at (916) 687-6870 to schedule a vaccine appointment to make sure your horses are protected!